Draft: 2012, Oakland Athletics, 1st rd. Addison is in his fifth season with Chicago ... was acquired from Oakland in a five-player deal that sent pitchers Jeff Samardzija and Jason Hammel to the A's on July 5, 2014 ... Made his major league debut in 2015 at the age of 21 ... At 22-years-old in 2016, he became the youngest player in franchise history elected to start the Mid-Summer Classic and second youngest All-Star overall, trailing only shortstop Starlin Castro who was named as a 21-year-old reserve in 2011 ... hit 21 homers and drove in 95 runs in 2016 ... Has the most RBI in Cubs postseason history with 19, including five in 2017 ... Among Cubs players at the conclusion of their age-23 season (since 1900), he ranked second in career homers (46), fifth in RBI (192) and extra-base hits (128) and eighth in runs scored (179) ... Entered the 2015 campaign as the Cubs second-best prospect by Baseball America ... Named Oakland's top prospect by Baseball America entering 2013 and 2014 ... Rated as the fifth-best prospect in baseball according to MLB.com entering the 2015 season ... ranked No. 3 on ESPN.com's Top 100 prospects list prior to the 2014 season and was No. 12 on MLB.com ... Earned post-season All-Star team honors in the California League in 2013 and the Arizona League in 2012 ... Named to the Arizona Fall League All-Prospect team in 2013 ... Played in the 2013 Futures Game and the 2013 AFL Fall Stars Game ... Originally selected by Oakland in the first round (11th overall) of the 2012 First-Year Player Draft ... Graduated from Pace (Fla.) High School in 2012 ... hit .460 with 37 home runs in his four-year H.S. career. Addison appeared in 130 games in his fourth season with the Cubs ... was placed on administrative leave by MLB on September 21, and on October 3, he accepted a 40-game suspension without pay for violating MLB's Joint Domestic Violence, Sexual Assault and Child Abuse Policy ... Batted .285 (70-for-246) with 13 doubles, one triple and five homers through June 30 ... hit .201 (35-for-174) with eight doubles beginning July 1 ... Notched a season-high four hits, May 18 at Cincinnati, going 4-for-4 with a walk, run scored and RBI ... Reached base a career-high five times twice in a 10-day stretch, May 9 vs. Miami and May 18 at Cincinnati ... on May 9, he hit a double and homer in the third inning, becoming the first Cub with two XBH in an inning since Brett Jackson in 2012 ... Recorded his second-career pinch-hit homer May 28 at Pittsburgh ... Went 3-for-4 with two doubles, a career-high tying three runs, one RBI and one walk, June 15 at St. Louis ... Notched a career-high tying four RBI in consecutive games, June 28 at the Dodgers and June 29 vs. the Twins ... went 2-for-4 with a homer, two runs and four RBI June 28 ... went 1-for-4 with a go-ahead grand slam in the fifth inning, June 29 ... marked his second-career regular season grand slam ... Missed time on the disabled list from August 20-September 1 with a sprained left middle finger ... batted just .138 (8-for-58) in his final 25 games beginning August 12. Addison batted .239 (84-for-352) with 21 doubles, three triples, 12 homers and 43 RBI in 110 games for Chicago ... missed over a month on the 10-day D.L., August 3-September 16, with a right foot strain and plantar fasciitis... Hit .280 (56-for-200) with an .803 OPS in 61 road games compared to a .184 average (28-for-152) and a .615 OPS in 49 home games... Batted .274 (26-for-95) in the season's "second half," 48 points higher than his .226 average (58-for-257) prior to the All-Star Break... After landing on the D.L., August 3, appeared in one rehab game with Triple-A Iowa, August 28, but had his rehab assignment cut short after re-aggravating the injury ... was activated, September 16... Hit his first-career pinch-homer, September 16 vs. St. Louis, in his first plate appearance off the disabled list ... went 1-for-1 with a career-high tying three walks the following day... Notched his 10th homer of the season, July 26 at the White Sox ... joined Ron Santo and Starlin Castro as the only Cubs players with three 10-homer campaigns by the end of their age 23 season... Hit a walk-off three-run homer, April 19 vs. the Brewers ... went 2-for-4 with the homer, walk and a career-high tying four RBI ... marked his second-career walk-off RBI and first walk-off homer... Recorded his first-career four-hit game, April 24 at Pittsburgh, going 4-for-6 with three runs scored and a RBI... Had a career-high four hits on three occasions ... went 4-for-5 with two doubles, a home run, three runs scored and two RBI June 22 at Miami ... his nine total bases marked a career-high and the three runs scored tied a career-mark... Had a strong start after the All-Star Break, going 9-for-22 (.409) with four doubles, two homers and five RBI on the "second half"-opening six-game road trip ... hit a game-winning homer in the ninth inning, July 14 at Baltimore, leading the Cubs to a 9-8 win after their 8-0 lead had disappeared... Went 6-for-34 with two doubles, one homer, two runs scored and five RBI in 10 postseason games ... went 2-for-4 with two doubles, one run scored and four RBI in the decisive Game Five of the NLDS at Washington. Addison made his first Opening Day roster and collected 21 homers and 95 RBI in his first full major league season ... at 22 years old, he became the second-youngest Cub to ever reach 20 homers, trailing only Ron Santo who hit 23 homers in 1961 at age 21 ... Was named to his first N.L. All-Star team and became the first Cubs shortstop to start the game since Don Kessinger in 1972 ... became the fourth Cubs shortstop named to the All-Star team in the last 50 seasons and the seventh overall ... Became the first Cubs shortstop to reach 95 RBI since Ernie Banks logged 117 RBI in 1960 (156 games at shortstop that season) ... additionally, his 95 RBI are the most ever by a Cubs player in their age 22-or-younger season ... Was credited with 19 defensive runs saved according to Fangraphs, tied for the most among all shortstops with San Francisco's Brandon Crawford ... ranked tied for fifth in DRS among all position players ... Went 9-for-23 with two doubles, one homer and 24 RBI with the bases loaded ... tied for the major league lead with the 24 RBI with the bases juiced ... hit his first-career grand slam, July 27 vs. the White Sox, providing him with a career-high four RBI ... Among all shortstops, he ranked second with 95 RBI, tied for eighth with 21 homers and sixth with 55 walks ... Batted .272 (70-for-257) with 18 doubles, 11 homers and 62 RBI in 75 games at Wrigley Field ... led the team and ranked third in the N.L. with 62 home RBI, trailing only Colorado's Nolan Arenado (85) and Carlos Gonzalez (64). w Marked the most by a Cubs player at Wrigley Field since Derrek Lee drove in 68 runs in 2009 ... Had 11 game-winning RBI, 10 of which came at Wrigley Field ... Recorded 22 RBI in July and 23 RBI in August, the two-highest RBI totals by a Cubs shortstop in a month since Ernie Banks had 24 in August of 1960 ... Collected three RBI in consecutive games, July 4-5 vs. Cincinnati ... Became the first Cubs shortstop with back-to-back three RBI games since Alex Gonzalez, July 20-21, 2003. w Recorded his first multi-homer game of the season, July 5 ... Reached base in a career-high 18-straight games, April 22-May 15 ... batted .318 (21-for-66) with a .438 OBP during that span ... Homered in three-straight games, August 21-23, including a two-homer game August 21 at Colorado ... Scored a season-high three runs, September 11 at Houston, going 3-for-4 with a homer and two RBI ... Got off to a slow start in the playoffs, batting only .042 (1-for-24) through Game Three of the NLCS, but hit .300 (12-for-40) with three homers and 13 RBI from that point forward ... overall, he batted .203 (13-for-64) ... his 13 RBI in one postseason are the most in Cubs history ... Went 6-for-13 with a double, two homers, five runs and four RBI in the final three NLCS Games ... hit homers in Games Four and Five of the NLCS ... his homer in Game Five's sixth inning was the second-latest go-ahead post-season home run by a Cubs shortstop … Joe Tinker's two-run shot in the eighth inning against Detroit broke up a scoreless tie in game two of the 1908 World Series ... Hit a grand slam in the third inning of Game Six of the World Series to extend Chicago's lead to 7-0 ... was the first by the Cubs in a World Series game and the 19th in World Series history overall ... his six RBI in Game Six tied the all-time record for a single Fall Classic contest. 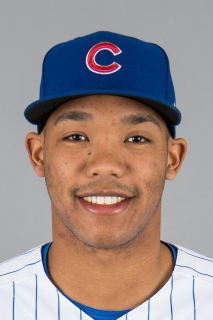 Addison Russell was selected from Triple-A Iowa in late April and, at 21 years old, became the club's everyday shortstop on August 7 ... batted .242 (115-for-475) with 29 doubles, one triple, 13 home runs and 54 RBI in 142 games. His 29 doubles tied for second-most among all rookies ... his 60 runs ranked tied for seventh and his 115 hits and 54 RBI ranked eighth. Led the team and ranked seventh in the N.L. with an average of 4.12 pitches per plate appearance. Collected 98 hits out of the No. 9 hole in the batting order, the most in the N.L. in a season since at least 1914. Played 61 games (53 starts) at shortstop, recording a .981 fielding percentage (4 E/210 TC) ... played 86 games (84 starts) at second base, primarily when he was first called up (.977 fielding percentage). Recorded a 2.6 defensive WAR at shortstop (ESPN). Went 43-straight games without an error at shortstop, August 13-September 30 (157 TC). His .259 average (60-for-232) in the second half of the season was 33 points higher than his .226 average (55-for-243) in the first half. Selected from Iowa, April 21, and made the start at second base that night in Pittsburgh. At 21 years, 88 days old, became the youngest player in the National League (Bryce Harper second, 22 years, 187 days), and third-youngest in the majors. Recorded his first career hit, April 22 in Pittsburgh, a third-inning single off Vance Worley. Logged a career-high 12-game hitting streak, April 26-May 9 ... hit .326 (14-for-43) during the 12-game run, the longest hitting streak for a Cubs rookie since Mike Fontenot's 12-game streak in 2007. The 12-game hitting streak came within his first 16 career games, making him the first big leaguer to accomplish that feat since Minnesota's Glenn Williams hit safely in all 13 of his games in 2005. w Additionally, became the first N.L. player to record a 12-game hitting streak (or better) exclusively out of the nine-hole in the batting order since Pittsburgh's Wilbur Cooper, a left-handed pitcher, his safely in 16-straight games out of the nine spot (15 starts, one relief appearance) in 1924. Reached base safely in 16-straight games, April 26-May 13 ... the streak was the longest by a Cub within his first 20 career games since Eddie Stanky in 1943. Drove in three runs with a bases-loaded double in the fourth inning in Cincinnati, April 26. w At 21 years, 93 days old, became the second-youngest second baseman ever to produce a three-RBI game for the Cubs … Ken Hubbs was only 20 years old when he drove in three runs in St. Louis , April 22, 1962. Hit his first career home run, May 1 vs. the Brewers Wily Peralta, a go-ahead solo shot in the third inning ... turned out to be the only run in Chicago's 1-0 victory. Phil Cavarretta was the previous Cub whose first career homer was the only run of the game when he turned the trick in the Cubs 1-0 win vs. the Reds, September 25, 1934. Collected a career-high three walks, July 10 vs. the White Sox. Recorded his first career multi-homer game and scored a career-high three times, September 4 vs. Arizona. Stole a career-best two bases and tied his career mark with three hits, September 30 in Cincinnati. October 2 in Milwaukee, collected a career-high tying two doubles for the fifth time. Began the season with Iowa, and hit .318 (14-for-44) with four doubles, one homer and nine RBI in 11 games prior to his promotion. Hit .250 (3-for-12) with a triple, RBI and stolen base in four post-season games. Left NLDS Game Three vs. St. Louis with tightness in his left hamstring ... would sideline him for remainder of playoffs. Addison Russell combined to bat .295 (76-for-258) with 14 doubles, one triple, 13 homers and 45 RBI in 68 games between Class A Stockton, Double-A Midland and Double-A Tennessee ... began the year in Oakland's chain before being acquired by Chicago in a five-player deal, July 5. Combined for an .858 OPS, thanks to a .350 on-base percentage and a .508 slugging mark. Recorded a .985 fielding percentage (4 E/273 TC) in 62 games at shortstop. Opened the year at Midland, but landed on the disabled list with a right hamstring strain after just two games ... was on the shelf, April 5-June 8. In 50 games with Tennessee, hit .294 (57-for-194) with 12 homers, including two multi-homer efforts. Played 11 games for Mesa in the Arizona Fall League, hitting .196 (9- for-46) with a double, two homers and 10 RBI. Spent nearly the entire regular season at Single-A Stockton where he batted .275 with 29 doubles, 10 triples, 17 home runs and 60 RBI in 107 games…was promoted to Triple-A Sacramento Aug. 31 and went 1-for-13 (.077) with nine strikeouts in three games…combined for a .269 average overall…was one of 12 minor leaguers to reach double figures in doubles, triples and home runs…named to the California League Postseason All-Star team and was named the Cal League's and the A's No. 1 prospect by Baseball America…tied for sixth in the CL in triples (10), ranked seventh in slugging (.508), tied for eighth in walks (61) and tied for ninth in extra base hits (56)…was a Baseball America High Class A All-Star…was ranked No. 3 on ESPN.com's Top 100 Prospects list prior to the 2014 season and was No. 12 on MLB.com…led the A's farm system in extra base hits (56), ranked second in slugging (.495), tied for second in triples (10), fourth in runs (86), tied for fourth in stolen bases (21), sixth in total bases (219), tied for seventh in doubles (29), eighth in on-base percentage (.369) and 10th in home runs (17) and walks (61)…led Stockton in runs (85), triples (10) and total bases (218)…with the Ports, he batted .282 (92-for-326) with 14 of his 17 home runs against right-handed pitchers compared to .252 (26-for-103) against left-handers…was batting .249 with a .332 on-base percentage and .467 slugging percentage in 55 games at the All-Star Break…then hit .305 with a .424 on-base percentage and .555 slugging percentage in 52 games after the break…had a .232 average with the bases empty compared to .350 with runners on base…hit .310 with runners in scoring position, including .394 with RISP and two outs…went 5-for-7 (.714) with a home run and 10 RBI with the bases loaded…batted .304 in 70 games hitting second and .217 in 37 games batting leadoff…appeared exclusively at shortstop on defense…committed 14 errors for a .968 fielding percentage in 105 games with Stockton…also had one error in two games at short with Sacramento…was named to the Arizona Fall League All-Prospect team following the season after hitting .282 with a home run and five RBI in 21 games with the Mesa Solar Sox…added 10 walks for a .361 on-base percentage…tied for second in the AFL in doubles (8)…was the starting shortstop for the East Division in the Fall Stars Game Nov. 2. Combined to hit .369 with seven home runs and 45 RBI in 55 games with three different teams in the A's farm system in his professional debut...signed with the A's June 15 after he was selected with the 11th overall pick in the 2012 First-Year Player Draft...despite the late start, he ranked second among A's minor leaguers in triples (9) and tied for eighth in stolen bases (16)...began his career with the A's affiliate in the Arizona Rookie League, was transferred to Vermont of the Short-Season New York-Penn League Aug. 2 and joined Single-A Burlington of the Midwest League Aug. 18...combined with all three clubs for a .594 slugging percentage and .432 on-base percentage...earned Short-Season League All-Star honors from Baseball America...hit .386 (68-for-176) with all seven of his home runs and 42 of his 45 RBI against right-handed pitching compared to .293 (12-for-41) against left-handers...had 23 of his 26 extra base hits against righties for a .642 slugging percentage...slugged .390 against lefties...batted .405 with runners in scoring position, including .500 with RISP and two outs...had 25 multiple hit games in his 55 contests...hit .416 in the sixth inning or later and .379 with a .438 on-base percentage when leading off an inning...appeared in 48 games on defense, all at shortstop...committed 10 errors for a .951 fielding percentage...also hit .480 in six games as the designated hitter...batted .408 with a .492 on-base percentage in 30 games hitting leadoff...also hit second (8 games), third (8), seventh (4), eighth (4) and sixth (1)...was named the A's number one prospect by Baseball America...was also tabbed by the magazine as the best hitter for average, best athlete and best defensive infielder among A's prospects. September 21, 2018 Chicago Cubs placed SS Addison Russell on the restricted list. September 1, 2018 Chicago Cubs activated SS Addison Russell from the 10-day disabled list. August 22, 2018 Chicago Cubs placed SS Addison Russell on the 10-day disabled list retroactive to August 20, 2018. Sprained left middle finger. September 16, 2017 Chicago Cubs activated SS Addison Russell from the 10-day disabled list. August 28, 2017 Chicago Cubs sent SS Addison Russell on a rehab assignment to Iowa Cubs. August 4, 2017 Chicago Cubs placed SS Addison Russell on the 10-day disabled list retroactive to August 2, 2017. Right foot strain. October 22, 2015 Chicago Cubs activated SS Addison Russell. October 17, 2015 Chicago Cubs reassigned 2B Addison Russell to the minor leagues. April 21, 2015 Chicago Cubs selected the contract of 2B Addison Russell from Iowa Cubs. April 9, 2015 2B Addison Russell assigned to Iowa Cubs from Tennessee Smokies. February 6, 2015 Chicago Cubs invited non-roster SS Addison Russell to spring training. October 25, 2014 Mesa Solar Sox reassigned SS Addison Russell to the minor leagues. July 6, 2014 SS Addison Russell assigned to Tennessee Smokies. July 5, 2014 Chicago Cubs traded RHP Jason Hammel and RHP Jeff Samardzija to Oakland Athletics for SS Addison Russell, CF Billy McKinney, RHP Dan Straily and cash. July 5, 2014 SS Addison Russell assigned to Midland RockHounds. June 16, 2014 SS Addison Russell assigned to Midland RockHounds from Stockton Ports. June 8, 2014 SS Addison Russell assigned to Stockton Ports from Midland RockHounds. April 6, 2014 Midland RockHounds placed SS Addison Russell on the 7-day disabled list retroactive to April 5, 2014. Hamstring strain. March 30, 2014 SS Addison Russell assigned to Midland RockHounds from Sacramento River Cats. February 4, 2014 Addison Russell assigned to Oakland Athletics. August 31, 2013 SS Addison Russell assigned to Sacramento River Cats from Stockton Ports. April 14, 2013 Addison Russell roster status changed by Stockton Ports. April 9, 2013 Stockton Ports placed SS Addison Russell on the 7-day disabled list retroactive to April 7, 2013. April 1, 2013 SS Addison Russell assigned to Stockton Ports from Beloit Snappers. January 9, 2013 Oakland Athletics invited non-roster SS Addison Russell to spring training. January 9, 2013 Addison Russell assigned to Oakland Athletics. August 18, 2012 SS Addison Russell assigned to Burlington Bees from Vermont Lake Monsters. August 2, 2012 Addison Russell assigned to Vermont Lake Monsters from AZL Athletics. June 20, 2012 Addison Russell assigned to AZL Athletics. June 15, 2012 Oakland Athletics signed SS Addison Russell.